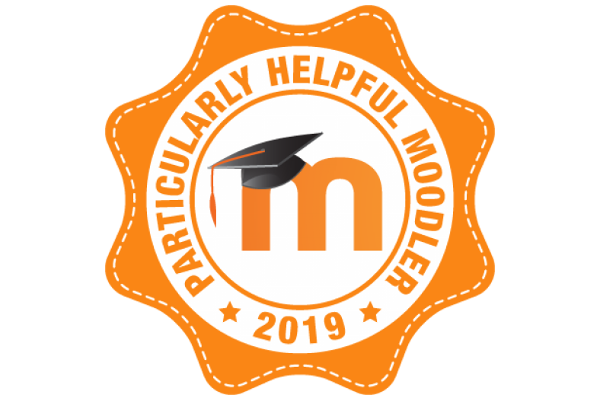 The Particularly Helpful Moodle (or ‘PHM’) designation is reserved for the handful of people who consistently contribute their time and knowledge to helping others on the Moodle.org community forums. This is volunteer time – no payment or suchlike. And PHM’s must be people who not only post useful information for others, but these responses have to be rated as “Useful” by multiple members of the community too. It’s other Moodle users that recognise these invaluable contributions. We are very pleased to share that Stuart gained his Moodle PHM for 2019 even before the end of January this year! Well done! By our calculations, that is nearing 10 consecutive years being a PHM !